Before the distillation, the harvest must undergo a drying time in full sun in order to lose the excess water and to avoid any risk of fermentation. A "prefanage" of about one or two days is essential: it avoids modifying the quality of the essential oil. This method also has the advantage of preserving bees by giving them time to fly after cutting. Capacity: usually 1,000 to 6,000 liters per vessel (up to 20,000 liters). 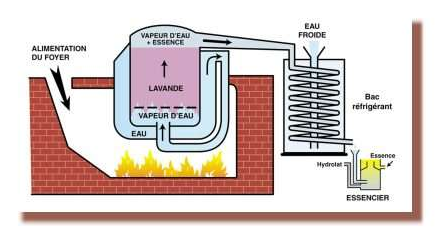 Essential oils are obtained by steam distillation. The stems and flowers are introduced into the vase of the distillery. They are carefully packed so that the steam that will cross them by driving the essential oil, can not take preferential paths. The gaseous mixture (water vapor and essential oil) passes through a gooseneck and is condensed in a "serpentine". It is then dumped in a "essencier" where it decants. The essential oil, lighter, floats and the distilled water is flavored by the traces of this essential oil. It's the hydrosol. The distillation time by the traditional method is relatively short: 30 to 40 minutes. Capacity: from 14 to 26 cubic meters per box. Duration of the past: from 1 hour to 1 hour and a half. 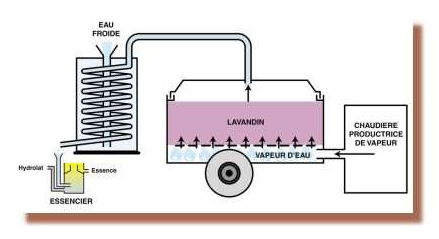 Since the early 1990s, a large number of lavender producers have been using a new harvesting system: Silage. The plant is crushed and sent to a tipping bucket or distillation box. The distillation is done immediately after cutting without any handling. There is no prefanage. The fact of distilling milled modifies the quality of the essential oil and it retains less well because of the particles of moisture it contains. Moreover, this technique is not suitable for obtaining a fine lavender essential oil to A.O.C. Yields are very variable depending on the region, the climate of the year, the age of planting, the variety and the distillation method.